Mary Gillespie taught home economics in the Sherman ISD for 20 years and after a long day of teaching baking, she would bake for fun! Since retirement, Mary has become very active at Covenant Presbyterian Church. She helps plan the annual “Divine Dining” event and oversees the Covenant Cooks, an educational outreach program that teaches how to create healthier and less expensive meals. Have all ingredients at room temperature. Preheat the oven to 375 degrees. Grease and flour three 8 X 2” round pans or line the bottoms with wax or parchment paper. In a large bowl, beat until creamy, about 30 seconds (1/2 lb.) 2 sticks unsalted butter. Gradually add and beat on high speed until lightened in color and texture, 3 to 5 minutes, 1-2/3 cups sugar. Add the flour mixture in 3 parts, alternating with the milk mixture in 2 parts, beating on low speed or stirring with a rubber spatula until smooth and scraping the sides of the bowl as necessary. In another large bowl, beat on medium speed until soft peaks form: 8 large egg whites and 3/8 tsp. cream of tarter. Gradually add, beating on high speed: 1/3 cup sugar. Beat until the peaks are stiff but not dry. Use a rubber spatula to fold one-quarter of the egg whites into the butter mixture, then fold in the remaining whites. Divide the batter among the pans and spread evenly. Bake until a toothpick inserted into the center comes out clean, about 25 minutes. Let cool in the pans on a rack for 10 minutes. Slide a thin knife around the cake to detach it from the pans. Invert the cake and peel off the paper liners, if using. Let cool right side up on the rack. 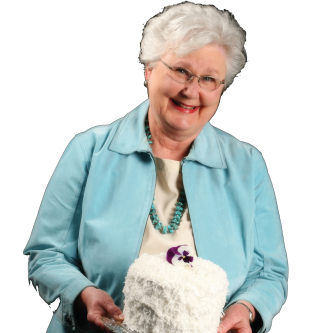 Mary’s recipe is based on the basic white cake in The Joy of Cooking. She recommends the Seven Minute Frosting, also found on The Joy of Cooking website.